Please win the games for the rest of the season. I do not like it when Chelsea team loses because my husband will become grumpy and moody. So yes, please do your best to win the EPL for my sanity sake. No one can live without friends(without going insane over a period of time). Then, around 4 to 5 years old, I start having friends with kids around my housing area in Taman Cempaka. There used to be a playgorund in front of my ‘then’ house and in the evening after the 5.30 cartoon, we will go out and play at padang. 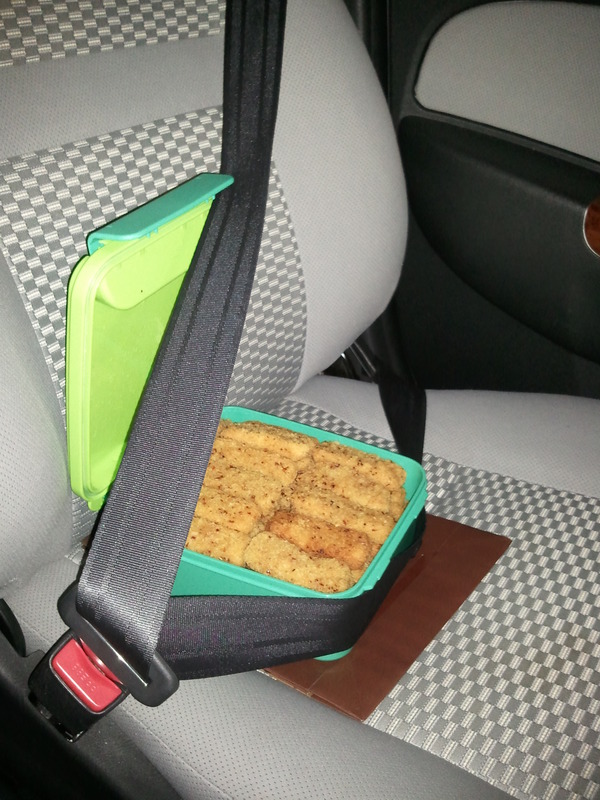 (unattended. mind you that those days it was safe for children to play outside.) We used to have costume competition & dancing competition among the ‘budak budak padang’. Then there was my school friends. During my primary, I was in an all girl school ‘Puteri Pandan 2’. I was lucky enuff that my sister also went to that school and some of my best friends were my sister’s friend sister (get it ? :P) My best friends those days were Leilani and Irin. I still have Irin as one of my facebook friends(blessing the facebook existance) but I lost contact with Leilani since she moved to Canada. Wonder whatever happened to her. In Secondary I went to a co-ed school.SM Seafield. At first it was kinda awkward to be friends with guys because I went to an all girl school before. I met Meela, one of my best friends there and we still are the best of friends till now. I’ve admitted to her before that at first, I kinda didn’t like her and vice versa. but in form 2, we got stuck sitting beside each other 🙂 and the rest is history. We used to lepak at each others house after school, doing stuff (what stuff, I cant remember) haha. We used to go to subang parade and either one of our moms will pick us up after we’re done beside the road. Entering the work force, I met Kak Ina. Boy, did we have some great times together. She was my best friend and also my boss (weird you think? surprisingly no) She was a great friend to me, more like a sister rather than a boss. She was my go to person whenever I have relationship problem, people problem, or any problem whatsoever. Now she is no longer my boss and lives in JB. (huhu) but we are still close and still keeping in touch with each other. I really appreciate all of you for being my good friends and in a way, direct/indirectly making me the person I am now. Even though we do not see it each other everyday (except you, yusnO) you guys remain close to my heart. muAhXx!!!! zOey reena : crOcodile and brOccOli? zOey : (while pulling my hand) it’s ok mama…it is just broccOlli..
Evenesis is a complete event management system where it could eliminate the usage of paper (invitation cards) and save trees!!! Whenever there’s an event, whole bunch of trees somewhere is being sacrificed as sketch paper and also invitation cards. 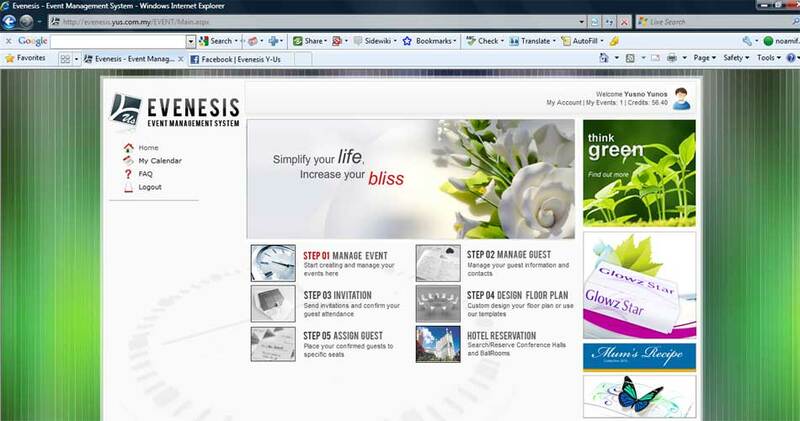 By using evenesis, everything is ready online for your usage. 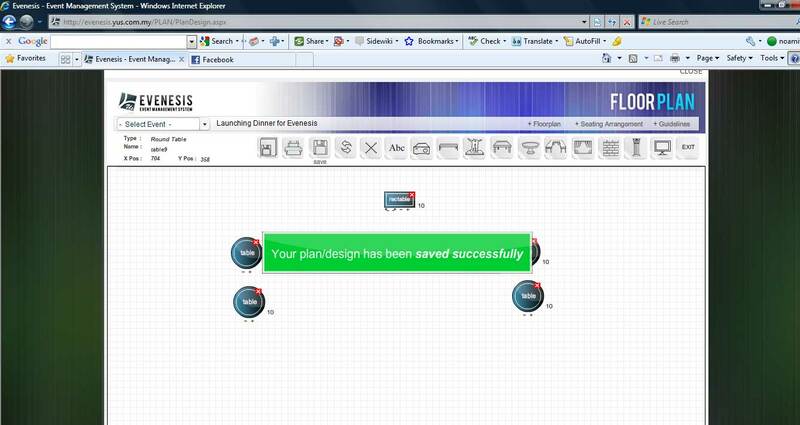 Floorplan design and seating arrangement is done online ans seamlessly. 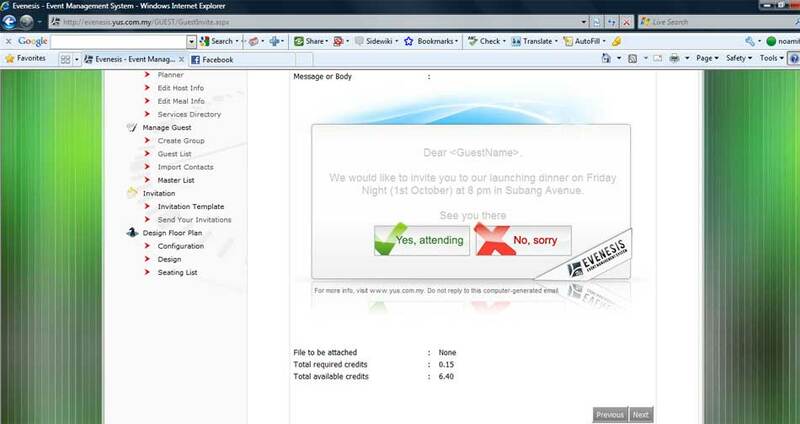 Invitations can be sent either by email, sms or both. 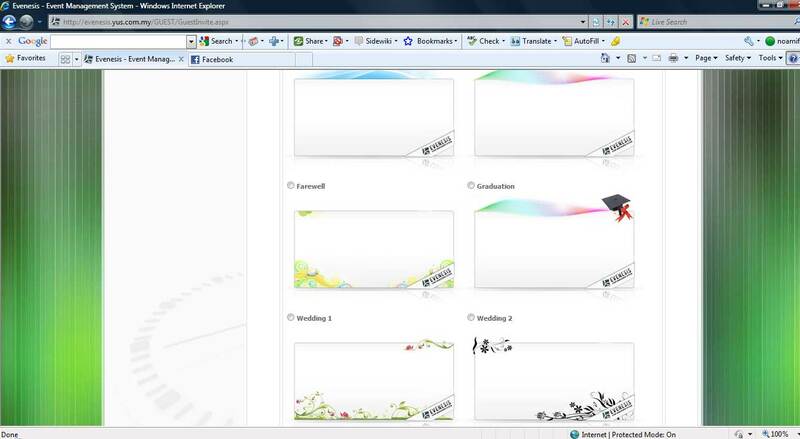 Evenesis even have cool templates for your invitation to be sent to your cool and hip guests. The best part is, for guest to confirm their attendance is just a click away by email or just reply the sms invitation and Evenesis will update automatically the status of the guest attendance in the system. Neat ey? Today I took the day off.. 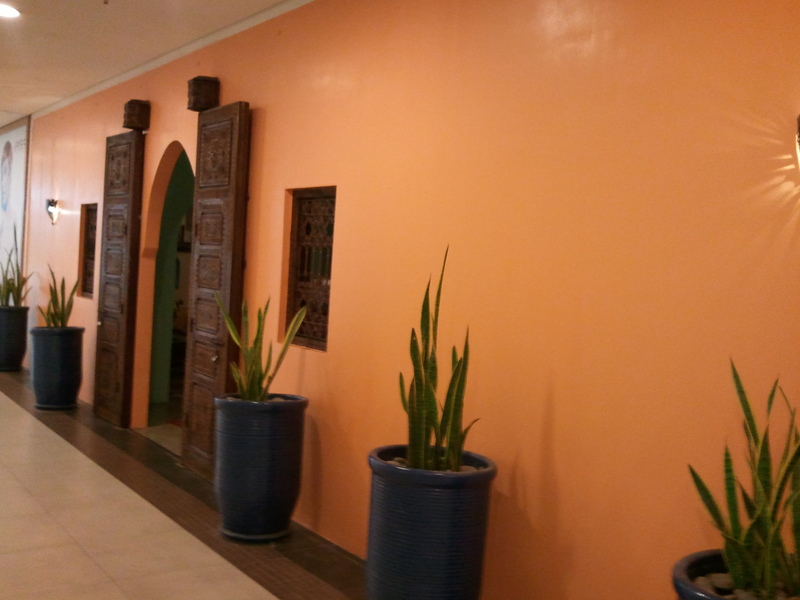 I arrived at Bangsar Village around 10.45 ish and went looking for the place (I’ve never even see the hammam spa physically) Saw a very traditional morrocan door and recognize it right away from their website. I was greeted by Geno with the most pleasant manner I’ve ever seen in a front liner. He then explained to me what my package is about and what they’re going to do with me during the treatment. There was 2 ladies attending me, one is a Morrocan lady named Izlan (sorry if I spelled your name wrong) and a Sabahan Masseus which I called Kak Shima. I was first brought to the changing room and given a locker with a magnet key bracelet (convenient). Locker no 1 yey!! 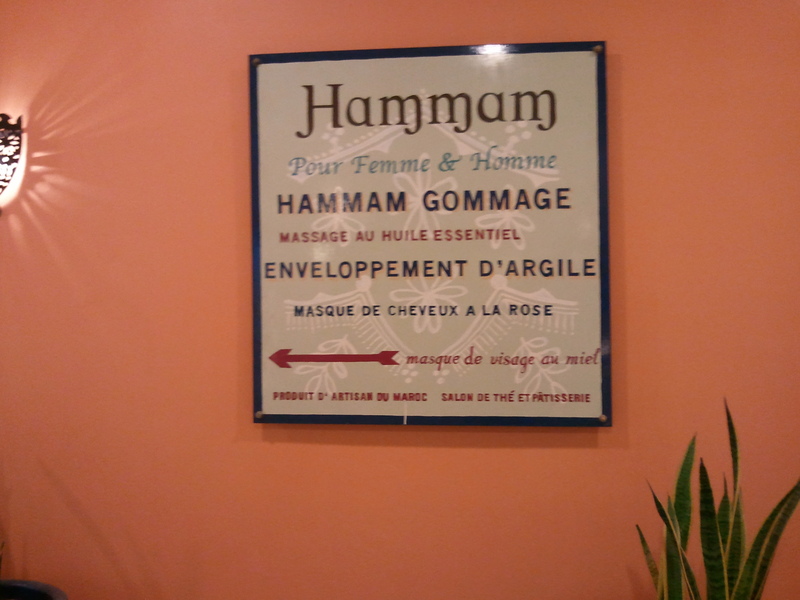 and throughout the Hammam & Gommage and the Moorish Body Polish, I was the only customer there. Heavenly~~. I really enjoy having the whole place to myself. I was then bathed (yes bathed!!) by Izlan with warm water in a warm marble room (something like a sauna i guess). Then she put a black mixture mixing thingy on my whole body and leave me to marinate. This mixture is to let your dead skin be easily remove during the Gommage session. After 10 minutes, she came back and clean me up with warm water. Then on to the next room where I lay on a warm marble bed for the Gommage(scrub) session. During this time, you can see all your dead skin being removed (quite gross come to think of it) to have a smooth clean skin 🙂 After Gommage, the Moorish body polish is spread all over my body and I am being left to marinate again in the marble room. This time i decided to lie down to have a full effect of the marble room. Izlan then came in to bathe me again (i feel like a baby 😛 last time i remember someone bathe me must be like more than 20 years ago :P) Shampoo, conditioned, soap, all the works. I don’t have to lift a finger. Not even to dry myself. 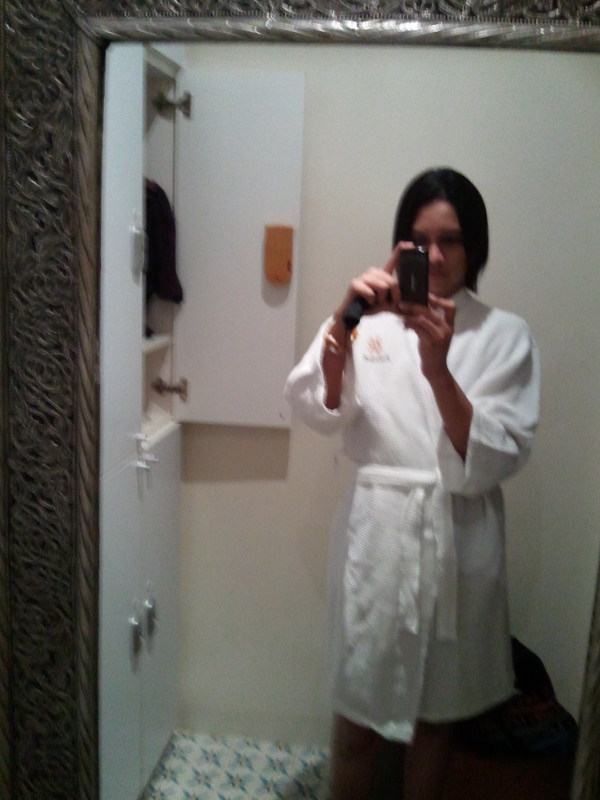 After half of the session completed, I was being escorted to the lounge area in my bathrob for a morrocan tea and baklava while waiting for my masseus to get ready. At that point of time I was feeling clean and shiny like a new penny..haha. Right now I’m feeling light, fresh and clean, polished? 😛 and relaxed from my Hammam Spa session. definitely worth the money. Looking forward for the relaxing deep sleep tonight as claimed by Geno today. haha. This is not her first time on LRT. 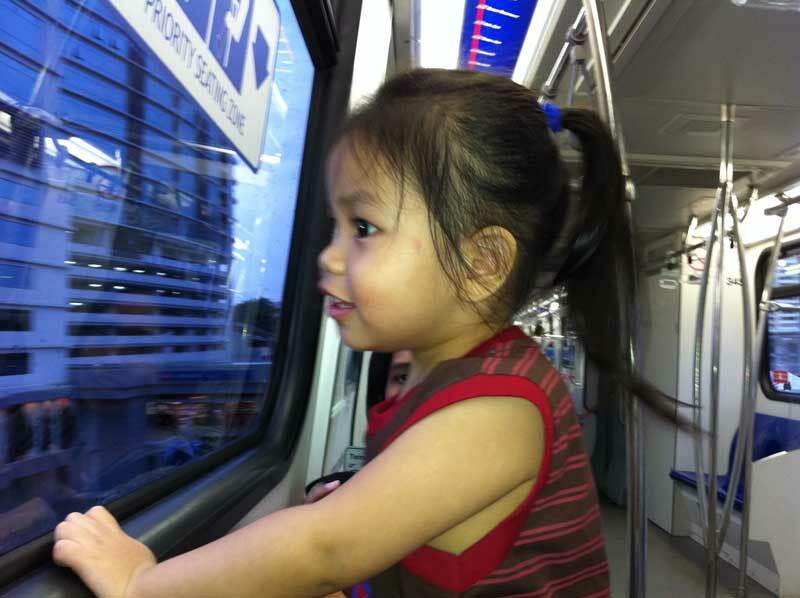 The first time we took her on LRT train was when she was 1year ++ (tak ingat la tu). So we parked our car at my office (conviniently just in front of an LRT station). . Not forgetting her pumpkin, we take a short ride to KL central, had our dinner there and went back.